Cloe Fontaine tries to paint a glimpse of Japan with her watercolours. 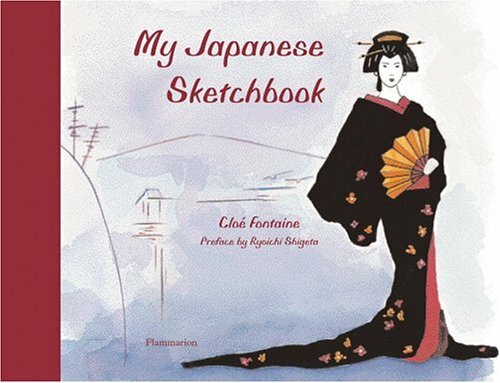 The sketches were done during a visit to Japan in 2001. There are four chapters that contains art of objects from everyday life. These are architecture, customs, sceneries and modernity. Cloe Fontaine appears to like textures and patterns as that seems to be the recurring theme in her paintings. There are paintings on the different patterns of bamboo doors, garden designs, etc. At the end, she takes on the popular manga culture by putting in some character through her watercolour sketches. With sketchbooks, I prefer those with far shots and lots of architectural drawings. While this book has some, the focus is more on individual objects and elements.